Sanyo is back this time round with not another projector, but three more Dual Cameras in the form of the VPC-GH2, VPC-CG102 and VPC-CG20. To keep up with the times, all three come with Full High Definition 1080 60i (1,920 x 1,080 resolution) video alongside the ability to snap photos at 14-megapixels. When it comes to style, all of them won’t disappoint with their sleek, modernist looks. Being small enough to pick up in one hand, you will realize that they are super portable, with the CG102 coming in black while retailing for $229, with the price point shared by the VPC-GH2 which is silver in color. Last but not least would be the $199 VPC-CG20, where you will be able to choose between silver or black colors. Value and performance would be the two keywords that we’re looking at with all three models. It is interesting to note that all your photos and video can be saved to SD, SDHC and the SDXC memory card format, which basically allows you to store up to a theoretical 2TB of data on a single card itself – assuming such cards actually hit the market in the near future, of course. The trio will also use a new, miniature high-speed image-processing engine which helps reduce the physical size of these Dual Cameras. Both the GH2 and CG102 comes with a new “double-range zoom” which will see the merging of both a wide-angle and telephoto zoom for videos. 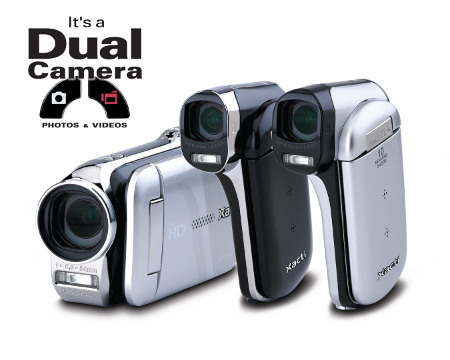 To sweeten the deal, they are both switchable at the touch of a button, enabling you to enjoy up to 12x double-range zoom. In layman’s terms, users will be able to switch between different zoom ranges in a similar manner as that of alternating between a couple of lenses with different zoom ratios. Zooming in on distant subjects requires but a simple touch of a button. As for the CG20, it might not be as able as its other two siblings, but at least you get a 5x optical zoom lens which is better than nothing.